We carry a wide selection of Wire suitable for wrapping stones and making shapes. This wire is so-called 'Half Hard' and retains its shape better than dead soft wire. It is frequently known as 'German Style' wire. Available in a wide range of gauges, colours and shapes, there is a Wraping wire perfect for your design. 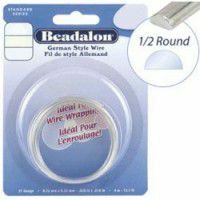 Our range of German Style Wire is produced by Beadalon.